Attacus atlas or the Atlas moth is one of the largest moths in the world. This black and white atlas moth drawing is from a huge natural history encyclopedia by Jean Charles Chenu (1808-1879). Atlas moths prefer dry rainforests, secondary forests and shrublands in southern and eastern Asia. They prefer the cooler temperatures available at night and generally rest during the day. Sadly, adult moths only live a few days – they don’t have a way to eat and have to rely on whatever fat reserves they managed to accumulate during the larval stage. The atlas moth drawing I’m sharing here is done in black and white. In nature, these moths are usually colored in shades of orange and brown. 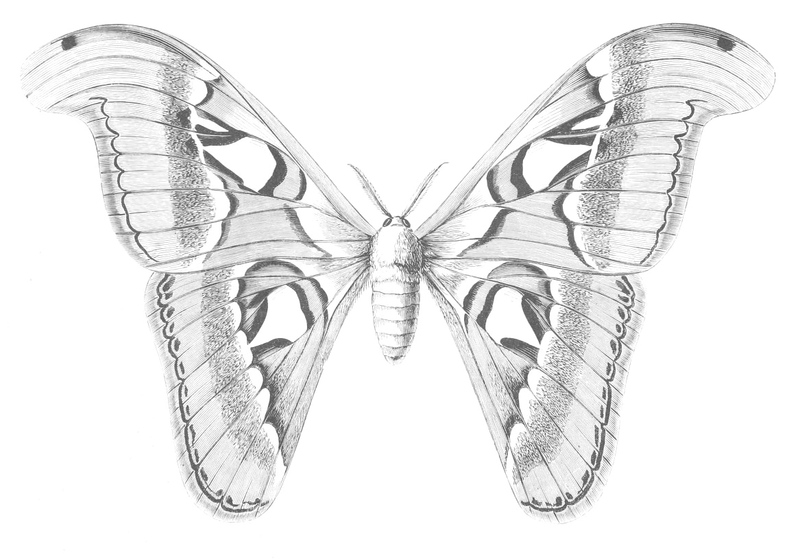 But, with such a large and detailed moth drawing, you could easily turn it into a coloring page image and color it any way you wish. Luckily, the attacus atlas moth drawing I’m sharing with you is absolutely huge. It’s too big to show here but you can access it by simply clicking on the drawing above.